Mesa Air Group says it still plans to begin interisland flights in Hawaii in the next quarter, and that a lawsuit by Hawaiian Airlines has only fueled its ambitions. Mesa Air Group Inc., determined to begin interisland flights next quarter, countersued Hawaiian Airlines for unspecified damages yesterday and accused the incumbent local carrier of violating antitrust law. The Phoenix-based regional carrier said in a federal Bankruptcy Court filing that Hawaiian's lawsuit last month against Mesa was an attempt to "monopolize" interisland air transportation by keeping Mesa out of the market for at least two years. Mesa said the suit and other Hawaiian actions were in violation of the Sherman Antitrust Act. Mesa said Hawaiian Air coerced two freight-forwarding companies, Vital Express and Pilot, into not accepting parts and equipment that Mesa wanted to ship to Hawaii for its new operations. 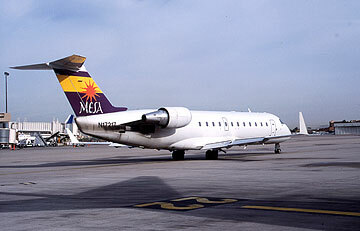 Mesa said Hawaiian told the freight forwarders that Hawaiian would not accept any Mesa freight on Hawaiian's aircraft. Mesa said it wanted to ship the freight on Hawaiian's widebody aircraft because it had more cargo space than narrowbody aircraft and it was the only widebody aircraft operator with nonstop service between Phoenix and Hawaii. The out-of-state carrier also said Hawaiian conducted a road-show disparagement campaign against Mesa targeted at investors interested in providing financial backing for Mesa's interisland operations or investing in Mesa's publicly traded stock. Mesa said its business prospects suffered as a result of Hawaiian's alleged violations. Mesa also said Hawaiian damaged Mesa's business relationships with freight forwarders, investors and future interisland customers. In addition, Mesa is seeking an injunction against Hawaiian to stop any continuing antitrust violations, and filed another motion to have the case moved to federal District Court and heard before a jury. Separately, Mesa filed a motion to have the count against it dismissed that seeks to have Mesa return confidential information obtained from Hawaiian in 2004 when Mesa was planning to invest in the local carrier. Mesa said it destroyed the information after being dropped as a potential bidder and that Hawaiian has no standing to request the information because the old Hawaiian Airlines ceased to exist after it emerged from reorganization. Hawaiian claims Mesa violated a nondisclosure agreement and used the proprietary information in preparing to start a new interisland airline. Mesa's countersuit describes Hawaiian's suit as a "sham." Jonathan Ornstein, chairman and chief executive of Mesa Airlines' parent, said Hawaiian's action has strengthened Mesa's resolve to come to the islands. "It's not going to make us pull out. It's not going to stop us," Ornstein said. "It's a desperate act and it shows exactly how concerned they are of our entry into the marketplace." Ornstein said Mesa still plans to begin flights in Hawaii during the second quarter and that its timetable is being dictated only by operational issues such as getting aircraft and spare parts to Hawaii and working out details of its space arrangement with the state Department of Transportation. "Our lawyers feel these guys were trying to pull out all the stops from bringing our low fares to the marketplace and felt the suit was necessary," Ornstein said. "Frankly, I always view lawsuits as negative energy, and a lot of time spent on lawyers' pay with very little good coming out of them. But it's clear these guys were willing to pull out all the stops and so we felt we had no choice." Hawaiian Airlines attorney Bruce Bennett accused Mesa of masking the real issue. "This lawsuit is not about competition," he said. "It's about the undisputed fact that Mesa had access to enormous amounts of Hawaiian Airlines' confidential information. The only question is how they used that information." Hawaiian claims Mesa downloaded documents that included more than 2,000 pages of detailed and highly proprietary information about Hawaiian's financial performance, projections and business strategy. That information provided detailed quarterly projections through the end of 2007, Hawaiian said. Mesa said in its countersuit that it destroyed all the Hawaiian Air information after its bid for the local carrier was rejected in May 2004, and it didn't begin to formulate a business plan to enter the Hawaii market until April 2005. But Bennett pointed out yesterday that Mesa said in a September 2005 press release that it began looking at the Hawaii market in early 2004 and labeled the venture "Project Hele." Mesa says Hawaiian never asked about the documents before, and claims Hawaiian is using the tactic as a back-door legal attempt to stall it from coming to Hawaii. "This has nothing to do with our use of confidential information," Ornstein said. "It's all about trying to get us from competing." "Everyone knows that the Hawaii interisland marketplace is highly competitive," Bennett said. "To suggest that Hawaiian Airlines or anyone else dominates the market is absurd." Ornstein said Mesa simply wants to compete in the marketplace. "We intend to do to Hawaii what Southwest did for California and the East Coast and really open the arteries of commerce."